Lapis Lazuli is said to have existed ‘before time’. In this, even the smallest of Lapis stones holds the knowledge stored in the Akashic Records. With Wind as its Element and its Color being that of the deepest Blue (Throat Chakra), this crystal’s energy gifts us with ‘total awareness’ and the ability to speak it clearly. Those who seek to connect with Lapis healing will find that their journey takes them inward, where the truest understanding of all that is lies waiting for us to remember our own divinity. The ancient name of “blue gold” gives us clues to how much humans adored Lapis Lazuli. For thousands of years. prior to better identification methods, people sometimes also called Lapis “sapphire”. We don’t see inferences to Lapis proper until the Middle Ages. Nonetheless this metaphysical stone was important enough to often be reserved for only the most noble and powerful rulers. That symbolism aligns this stone with energies for leadership and authority. For this purpose Lapis packs the biggest magical wallop in the form of signet rings. One of the more interesting applications for Lapis Lazuli was as a component in paint. Artists use Lapis to create the intense blue pigments featured in Renaissance works. It remained the pigment of choice for depicting the sky or sea well into the 19th century. As a result we cannot wholly separate this stone’s spirit from the elements of air and water working cooperatively. Air provides Lapis with communication characteristics while water affords healing and waves to carry us where fate awaits. Lapis Lazuli is actually a rock that has several different minerals including Sodalite and Pyrite. This combination is important because Sodalite represents peace, proficiency and an active conscious mind. It is very lucky for writers. Pyrite brings fiery energy to the table, and also strengthens communication. Blended together Lapis Lazuli becomes a full-force for elemental workings. It also symbolizes honesty, spiritual wisdom, self-actualization and revelation. Lapis will not let anyone steal your thunder or undermine your personal power. It challenges us to stand in a place of authority with true integrity. Egyptians seemed particularly enamored of Lapis’ magical powers. The stone appeared on sarcophagus, scarabs and numerous types of jewelry. The blue eye shadow seen in many historical images was made from Lapis, and many burial items had Lapis Lazuli adornment. The intensely detailed mythology about afterlife journeys throughout this part of the ancient world ties Lapis to past life explorations nicely. The matrix of this extraordinarily powerful healing crystal vibrates backward into your soul’s history. You may find yourself dreaming of various lives, particularly those that impact your current reality. Keep a dream journal handy. European mystics looked to Lapis as a bridge between the worlds. Carrying it protected against unwanted spirits, while also allowing the bearer to speak with the dead. In the Far East people used it as a talisman and Buddhists speak of this mystical crystal as a stone of peace and a meditative life. When you have trouble speaking your truth, the Lapis Spirit can open your throat chakra and lets those words out that you’ve been swallowing for too long. Be prepared – this is not a gentle energy. There is no beating around bushes with Lapis on hand. Its energy is direct and honest (think tough love on steroids). 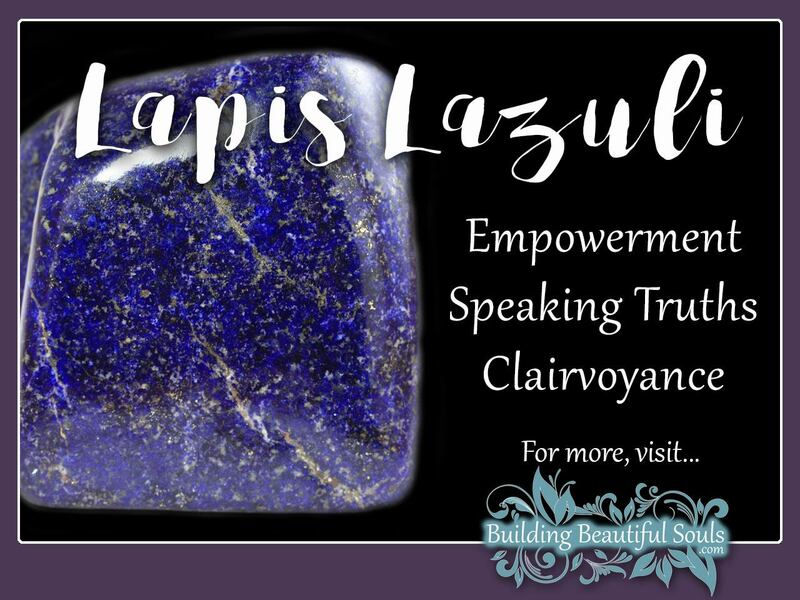 Lapis Lazuli is an excellent stone for people in a position of sharing their ideals and beliefs. It keeps the head and heart (what we know in fact vs. what we trust by faith) in balance. It also provides whomever uses it with greater wisdom in applying healing skills and psychic information. When you want to hone your intellect, seek out Lapis. It supports those who seek after knowledge as a life-long quest by aiding your memory and improving your ability to process information. Remember, however, that the intensity of the stone’s color and its shape both change the energy matrix of this healing crystal. Attune to those subtle differences for the greatest success. There are several theories as to how Lapis Lazuli got its name. There is the Latin term that means azure stone. There is also the more poetic lazaward in Arabic, meaning heavenly blue or sky blue. No matter the name, Lapis appeared throughout the ancient world – from Babylonian seals to the makeup worn by Cleopatra in Egypt. The bible mentions God standing on a road paved with “lapidus sapphri”. Scholars, realizing that sapphires post-dated Lapis, agree that this is actually Lapis Lazuli, and illustrates the great respect Christian writers had for this stone’s ageless beauty and symbolism as designating leadership and authority.